It is a cloudy, wet day as I navigate the endless road repairs in Windsor and find my way to Silo, the craft distillery founded by Barnard residents and partners Peter Jillson and Anne Marie Delaney. Happily, entering the elegant wooden building is a bit like entering a patch of bright sunlight while walking through a dark forest. Neat rows of vodka, gin, whiskey, bourbon, and other spirits with colorful labels sit in a bright room filled with light-colored wooden furniture. A glass wall on the left separates the reception area from a room dominated by a tall, shiny copper still connecting equally shiny copper piping to copper vessels and all the other paraphernalia that goes into making Silo’s products. Delaney’s Irish lilt, the glow of spirits, the warmth of the wood and the sight of the copper still act as an immediate antidote for the cold, gray Vermont day. “Would you like a tasting?” Delaney offers, seeing my gaze linger on the bourbon, as Jillson comes up to greet me. Alas, I must refuse the offer on this working visit. Vodka and gin, it turns out, can be made in seven to 10 days, while bourbon must age over time. Bourbon is expensive to produce, Jillson says, and they had to wait until the distillery generated sales before they could expand to producing whiskey. My distillery education has begun. The ingredients for Silo’s spirits are locally sourced, Delaney chimes in. “Our gin is made from locally grown corn from a farm in North Clarendon,” she says, along with Vermont Honeycrisp apples. Interviews for this column usually take place in a restaurant, but here we are, in a distillery, with nary a waiter in sight. We decide to walk to nearby Harpoon Brewery, located in Artisans Park directly across from Silo. “But you must see the work area before we lunch,” Jillson says, and the three of us walk into the room full of shiny copper things. Dominating everything is the big, 650-liter custom-made copper pot still. “See the basket on top of the still?” Jillson says. They fill that with botanicals like juniper berries and Vermont Honeycrisp apples to make their gin. There is nothing artificial in their spirits, they say. The rules for bourbon specify that the grain mash must be at least 51 percent corn (the rest is rye). It must be aged in new, white oak barrels that can be used only once to produce bourbon. Silo uses small, 10-15 gallon barrels to reduce the aging time. Whiskey is made with a variety of different grains and has much more production flexibility, “which is why all bourbon is whiskey, but not all whiskey is bourbon,” Delaney says. We take advantage of a break in the rain to walk over to Harpoon’s large and airy lunchroom filled with happy beer-loving visitors. I want to know how Jillson, an eighth-generation Vermonter, met Delaney, an Irish woman from Dublin, to make bourbon in Windsor. But we are interrupted by Shawn, our felicitous server, and we focus on Harpoon’s luncheon menu: A chicken curry wrap for Delaney, a muffuletta for Jillson, and a grilled cheese for me. Jillson orders the brewery’s signature UFO White while Delaney and I stick to tall glasses of water. “We met in Hanover many years ago,” Jillson says. 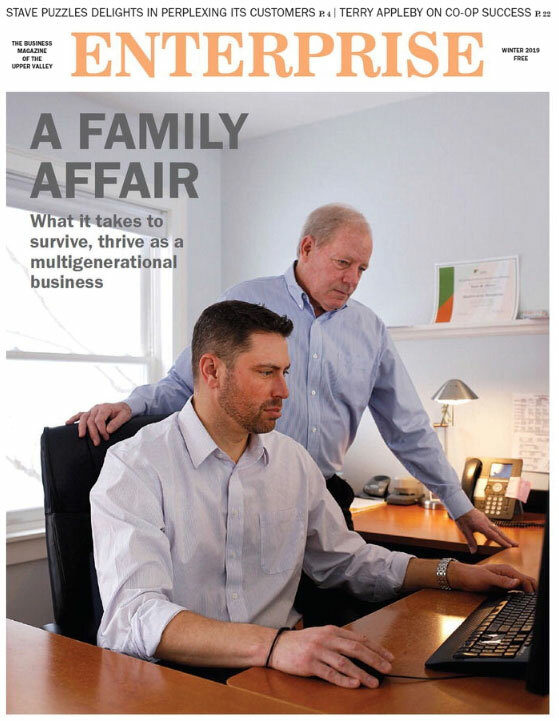 “My career was developing sales and marketing teams for the health care industry while living in Boston.” But, he says, “I didn’t actually live in Boston — I lived in an airplane.” After 30 years in the business, he was looking for an exit strategy. Delaney, meanwhile, also had moved to Boston. “I was working in a jazz club,” she says. They met again, and decided to make a life together. They had a house in Vermont that they visited on weekends. As part of Jillson’s exit strategy, he had started to think about a rapidly growing business — craft distilleries — and getting back to his deep roots in Vermont. He started to put together a business plan. “Did you know Vermont has more (craft distilleries) per capita than anywhere else in the country?” he asks. The big question was how the city girl from Dublin, now well settled in Boston, would fare in a rural state. We get to talking about the craft distillery business. 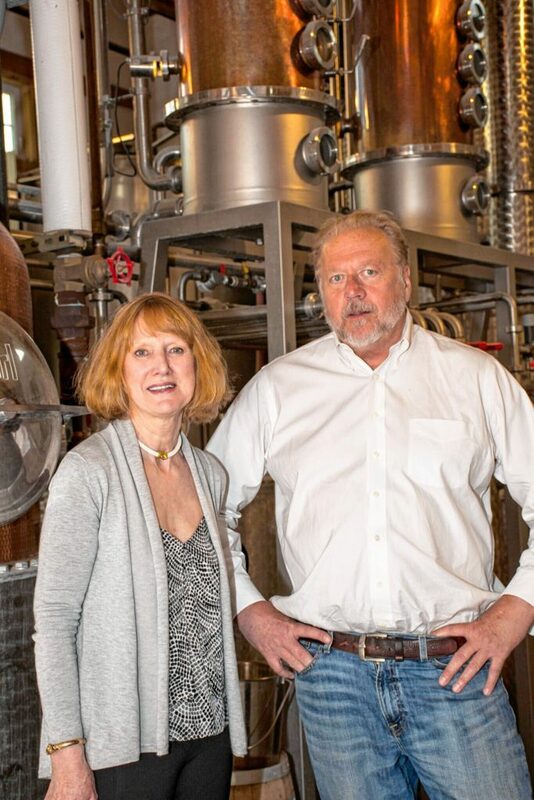 Jillson did not know anything about distilling, “but there is this wonderful ecosystem that I plugged myself into to learn the business,” he said. From a distillery in Bethel, N.Y., he was introduced to the German firm that has been making handcrafted copper stills for 150 years. He attended workshops and seminars offered by Michigan State University and Cornell University, sent Vermont grains to Michigan and had the formula for their vodka completed before production began in Windsor. Money for the venture — at about $600,000, the distilling equipment was the bulk of the investment — came from a combination of sources: “our money, low-interest state economic development loans, commercial banks and private investors.” Both went out of their way to praise the Springfield Regional Development Corp. for helping them find their location and navigate the bureaucracy to set up the business. Then, about three years ago, with workshops successfully completed and equipment installed in the new building — and with bills coming due — it was time to make the first batch of their own vodka. Today, with Jillson overseeing the distillery and Delaney in charge of the tasting room, Silo has the capacity to produce around 15,000 cases a year and employs six people who work two shifts. The next stage of the business plan calls for expanding distribution, and then it will be time to add another still.